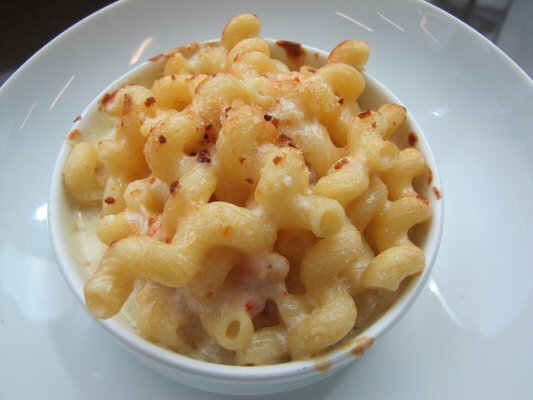 One of the all time classic side dishes is Macaroni and Cheese or as it is more commonly referred to “Mac N Cheese”. Now this college dorm room staple has been around for decades because it is inexpensive to buy and very easy to make…… as long as you can boil water you can make store-bought Mac N Cheese. My big issue with store-bought Mac N Cheese, however, is that it lacks substance and flavour and I just find it unappealing so I set out to find a scratch made version. My search of the Internet revealed that 98% of all Mac N Cheese recipes have one thing in common— they all start with a basic Bechamel sauce. What sets them apart are the different cheeses that are added and the proteins such as bacon, ground beef, ground chicken, shrimp and even lobster. Since I eat a lot of bacon and chicken as it is and seafood has gotten expensive I took a peek in my grocers seafood section to see if I could find an alternative because I really wanted to use some kind of seafood in my Mac N Cheese. What I settled on was—- Lobster flavoured Pollock and before you question my sanity let me tell you that it is really not that bad…. and this from a guy who would not give you a dime for a train load of lobster….. and now you can see why I named this post “I wanna be Lobster Mac N Cheese”. In a medium saucepan heat the milk until just simmering. Spoon the Mac N Cheese into individual serving dishes. If using the Panko, add the Panko to some melted butter and sprinkle on the Mac N Cheese.